Earlier this year, Particle unveiled three IoT development boards based on nRF52840 Bluetooth 5/802.15.4 WiSoC and supporting Particle Mesh, which interestingly is not based on Bluetooth Mesh or even Bluetooth, and instead relies on Thread specification/OpenThread implementation, and the 802.15.4 radio of the chip with Bluetooth only used for the initial setup stage. Particle announced the shipping date (October 2018 or… this month) for their Mesh boards pre-ordered in February, as well as three new products in a recent blog post. One of the products is a family of system-on-modules compatible with Particle Mesh, while the other two are related IoT developer tools. 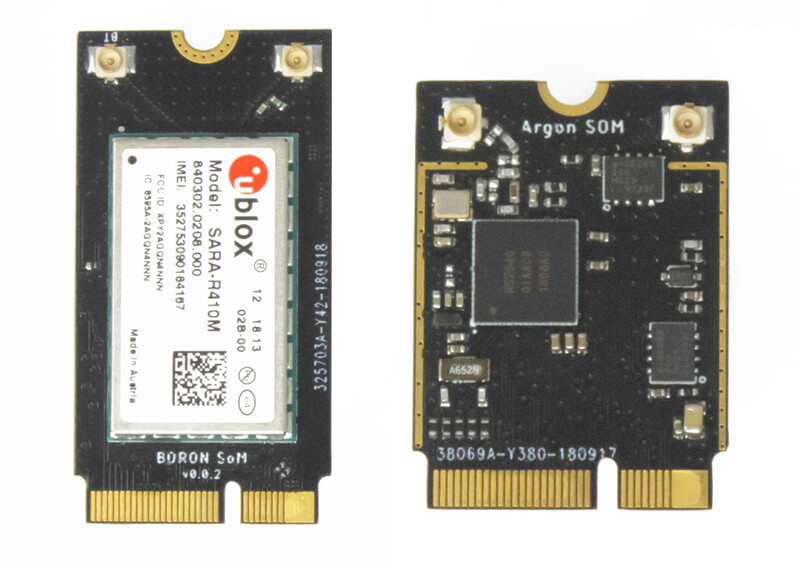 The Particle Mesh SOMs will have similar names and features as corresponding Particle mesh developers kits such as Boron (NB-IoT / eMTC + BLE + Mesh) and Argon (ESP32 WiFi, BLE + Mesh), but with an edge connector and designed as enterprise-grade, production-scale version of the dev boards. The modules are still in development, and will become available in 2019. The Particle IoT Rules Engine is a drag-and-drop IoT application builder based on the popular Node-RED open source tool. It provides a visual interface to wire together sensors and nodes, and program their behavior without having to be a software engineer. 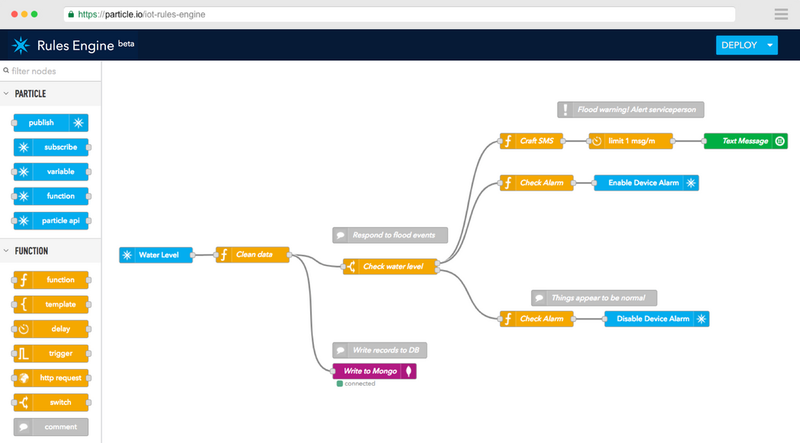 The IoT Rules Engine is still in private beta, but you can apply for access if you are interested. 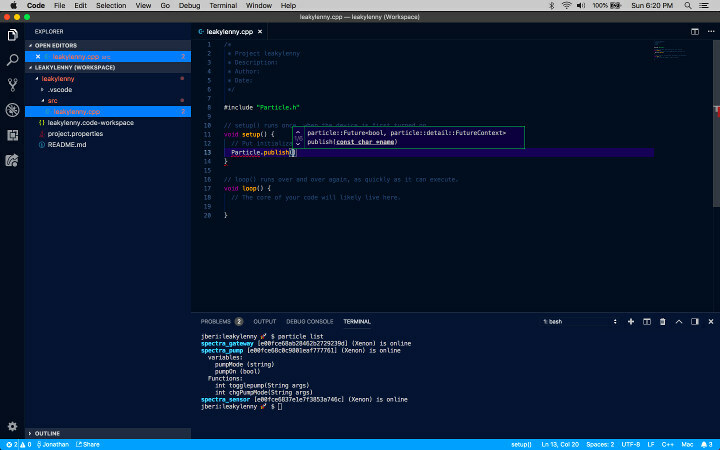 The second tool is also based on an existing solution, as Particle Workbench desktop program optimized for professional IoT development is powered by Microsoft Visual Studio Code. Particle Workbench provides tools to program and debug professional-grade apps for the Particle platform, with features such as features like IntelliSense, breakpoint debugging, Git support, local build, hardware debugging and more. Particle Workbench is also in beta, and you can find out more details, as well as access the developer preview via the product page.